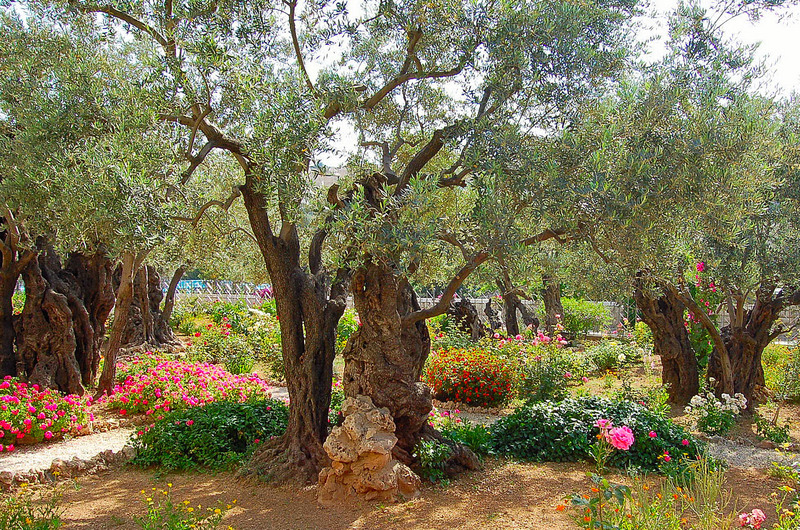 During Passion Week, Christians around the world will rehear the story of Jesus’ agony in the “Garden of Gethsemane.” Travelers to Jerusalem can visit what is said to be the very garden. But whether Jesus ever set foot in that garden is far from certain. Surprising to many Christians, the Bible never mentions a “Garden of Gethsemane.” The Gospels of Mark and Matthew report that Jesus shared a Passover meal with his disciples before going to “Gethsemane,” a corruption of Hebrew words literally meaning “wine press for oils,” where he prayed and was then betrayed by Judas. The Gospel of John says Jesus prayed with his disciples the night before Passover and was later betrayed by Judas in an unnamed “garden.” From these accounts, some Christians concluded that Gethsemane was a garden, while others concluded Jesus prayed at the site of a wine press and then went to a garden. Since the fourth century, Christians have identified multiple locations near the foot of the Mount of Olives matching their own conceptions of Gethsemane. The most popular site is a walled garden across the Kidron Valley from the Temple Mount. It includes flower-lined paths and eight olive trees carbon-dated to the time of the Crusaders, making them the oldest such trees on earth. The adjoining Church of All Nations, built in the 1920s on the site of earlier churches, is claimed to cover the stone on which Jesus knelt while he prayed. At least three other locations on the Mount of Olives, including a cave said to have housed an ancient wine press, are also associated with the Biblical accounts of Jesus’ agony in Gethsemane. 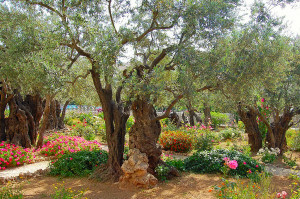 The traditional choices for Gethsemane are all near major first century roads crossing the Mount of Olives. Some scholars believe a secluded location north and east of traditional locations would be a more likely spot for someone seeking to pray. For Christian visitors to Jerusalem, whether the traditional sites of Gethsemane are precisely the place of Jesus’s agony is irrelevant. Being in the vicinity of where Jesus prayed on the night before his crucifixion is close enough.